I have always loved simple light-filled Swedish Style Decorating. Recently I did a little research (Isn’t the internet grand?) into Swedish Gustavian Style and I am smitten. This style of decorating was named after King Gustav III of Sweden, an eighteenth century ruler who brought the influences of Paris and the French Neoclassical Style to Sweden during his reign. The colors used for this style are perfect for our Miss Mustard Seed Milk Paint European Line. Whites, off-whites, grays and light blues all take a place perfectly in this style. For most of us decorating any style is really an exercise in mixing the old with the new and telling your story with carefully curated family pieces. Therefore this post isn’t a purist’s Swedish Style Decorating post but more a how to add a bit of this style to your home using what you already have. I love white washed woods, rustic linens and soft painted interiors with natural elements. Swedish Style Decorating uses soft tones to create a lighter interior so necessary during the long dark winter days of little sun in that region. The grays, gray-greens and gray-blues of Gustavian style also work well with vintage and farmhouse decor and of course French Country. The furniture I have studied from this style has simple lines yet more artistic than primitive. The decoration and ornamentation is elegant and natural, highlighting a quality and craftsmanship not easily found in this modern world. Almost all the furniture is painted with lots of worn wood showing through. In this post you will find my interpretation of the Gustavian Swedish style using easily found everyday pieces and the natural elements I regularly use in my decor. 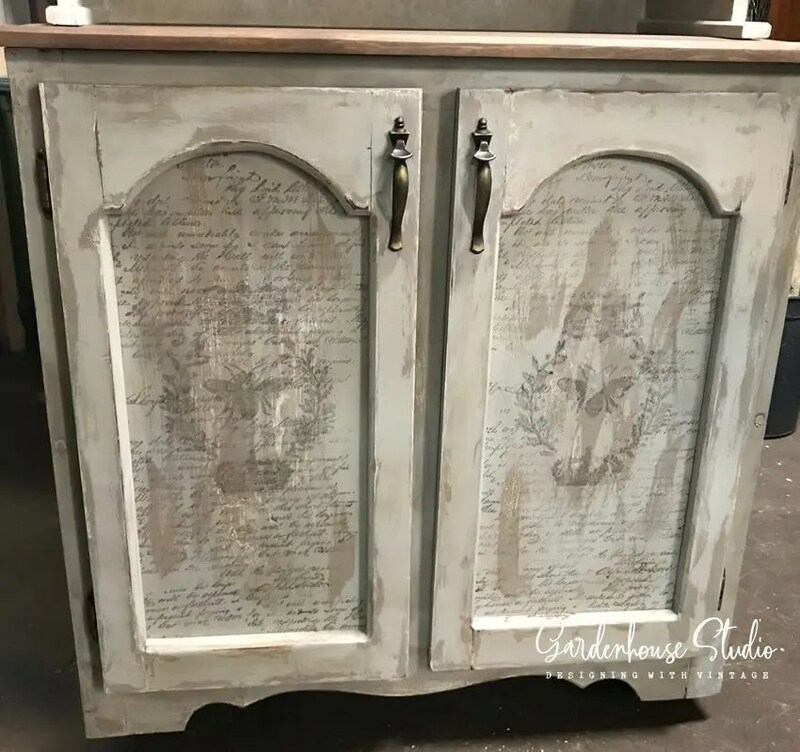 The piece I have have chosen to interpret this style is an old Hutch we found on the local FB Marketplace and then purchased out of the seller’s storage unit! 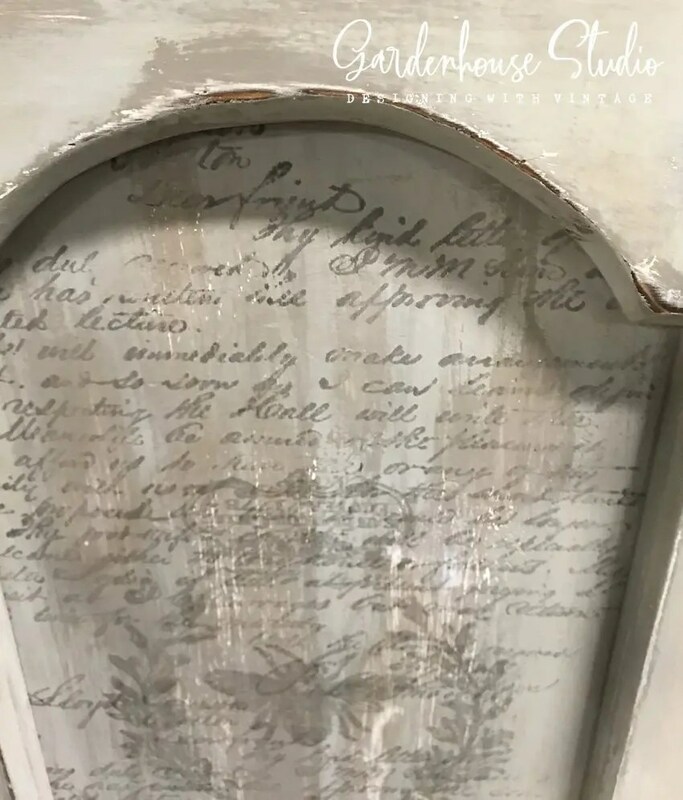 I wanted it to be super distressed and vintage looking with just a bit of decoration so I choose to stamp the door fronts with our “Queen Bee Stamps” to add a bit of European Charm. The hutch was sanded and then primed with Bin to prevent the pine knots from bleeding through. The glass in the top doors was removed and replaced with hardware cloth for a more country farmhouse look. The Miss Mustard Seed Colors that we choose to paint the hutch with were Schloss and Mora. 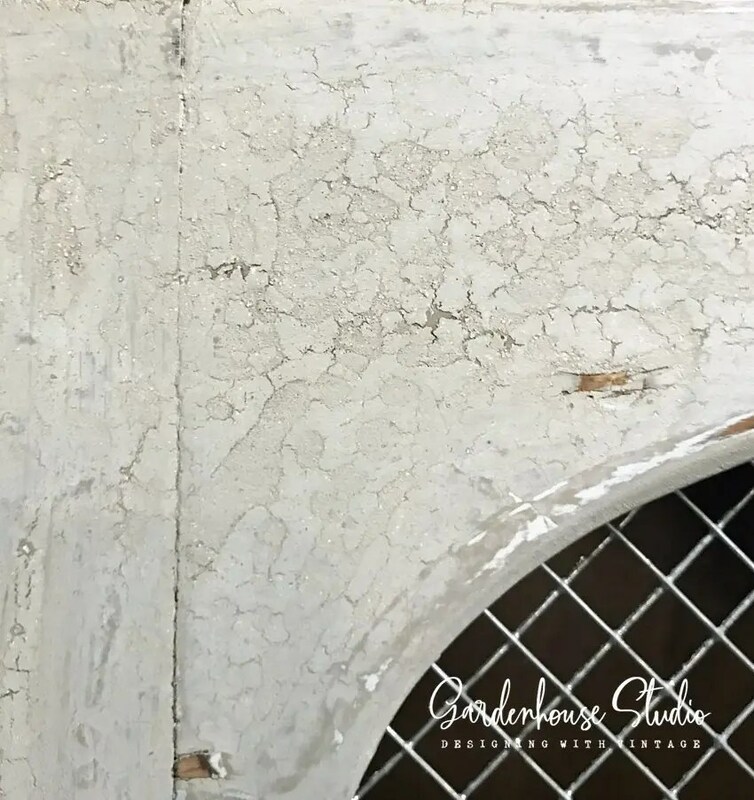 The whole piece was first painted Schloss and then we used Artisan Enhancements Easy Crackle to create crackled, worn, and weathered sections for texture. You paint the crackle on just like paint but don’t overwork it. We let the crackle dry completely and then painted the piece with Mora. We found that the Easy Crackle worked perfect, after we applied the Mora over it, when we dried it outside in the sun. Each layer should be thoroughly dry before the next layer is applied. Here is the finished hutch with its brand new charm. 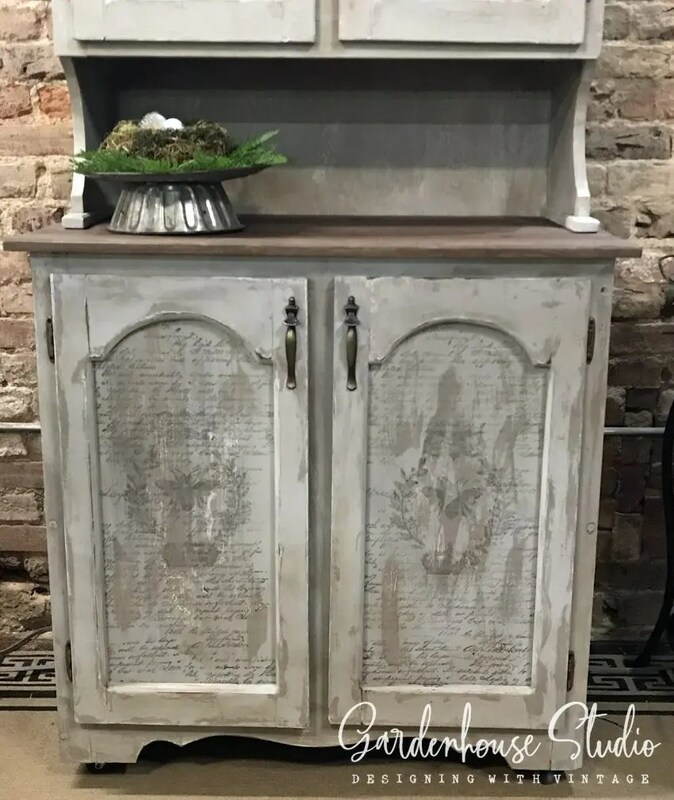 The Miss Mustard Seed Milk Paint in Schloss and Mora are perfect colors to create a Gustavian Finish on this piece. The Artisan Enhancements Easy Crackle helps create an old world look for a Swedish Decorating Style using an everyday piece of furniture and a bit of refinishing! We have several other pieces in the studio that we are adapting to this style so stay tuned for Swedish Decorating Style Part II. Gorgeous! I always learn so much from you! You are awesome and a wonderful friend! Love my job!